If you’ve attended Baselworld over the last four years, you’ve likely heard tell of an “Eric Singer sighting” – catching a quick glimpse of the watch-crazy rock drummer as he hurries from booth to booth checking out the new watch offerings. 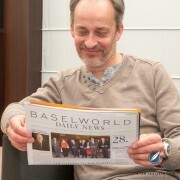 His ever-increasing presence at the fair has become something of part of the Baselworld legend. I had a chance to catch up with the horophile musician after Baselworld 2017 to get his personal list of the top ten watches he saw at the fair. Singer also tends to favor the retro style that is currently all the rage in watches. While he may attribute that to being a certain age, I put it down to simply having good taste. Though he appreciates Quill & Pad’s lean toward the independent watchmakers, Singer also understands that these timepieces are generally not accessible to “regular guys,” but rather more to serious collectors. So he generally looks for a degree of affordability in the timepieces he purchases. And without further ado and in no particular order, please enjoy Eric Singer’s top 10 watches of Baselworld 2017. “Rolex is a constant favorite because it looks great with suits and sports clothes alike,” Singer said, though he also stressed that he is not generally a “Rolex guy” because he doesn’t feel versed in the subtleties of the vintage market for this brand. That is certainly something he shares with the majority of watch lovers, who often times are left confounded by the variety of exact details that determine the crazy pricing of some vintage Rolex models. Singer was very impressed by the 43 mm sizing of the new Rolex Sea-Dweller – up from the previous 40 mm – something our own Simon Cudd also pointed out in Quill & Pad’s traditional round table post following Baselworld 2017. “It’s very proportionate,” Singer described it, at the same time relating that he didn’t mind the “Cyclops” magnifying lens over the date at all, an element that has garnered some critique in the specialized press. “You also wear ‘the crown’ for a reason: consistency, brand power, and perception,” he explained. This new model celebrates the fiftieth anniversary of the first Sea-Dweller from 1967, which is referenced by the red lettering of the Sea-Dweller name on the dial. This classic new ultra-thin Classique Reference 7147 with its high-fire enamel dial and playful secret signature has been widely acclaimed in the specialized press and even in our own Quill & Pad team members’ Top 5 selections. This timepiece was originally introduced in 2016 with a guilloché dial. The new enamel version seems to have taken on a life of its own, though! Singer loves the “Heritage” section of TAG Heuer’s modern offerings and was immediately smitten by the new Autavia, which was certainly eagerly awaited by fans of the brand. A slightly differently styled version of this watch is due to be introduced a little later in the year, and that is actually the one that he prefers. Omega pays homage to an incredible year with classic releases: 1957. Head of product management Gregory Kissling explained to me that Omega unfortunately no longer had the notes and plans for the three watches from that year that went on to become the foundations of classic lines at the brand, so the technicians used a unique digital scanning technology to make loyal re-creations before updating them to today’s standards (such as using sapphire crystal instead of Plexiglas). 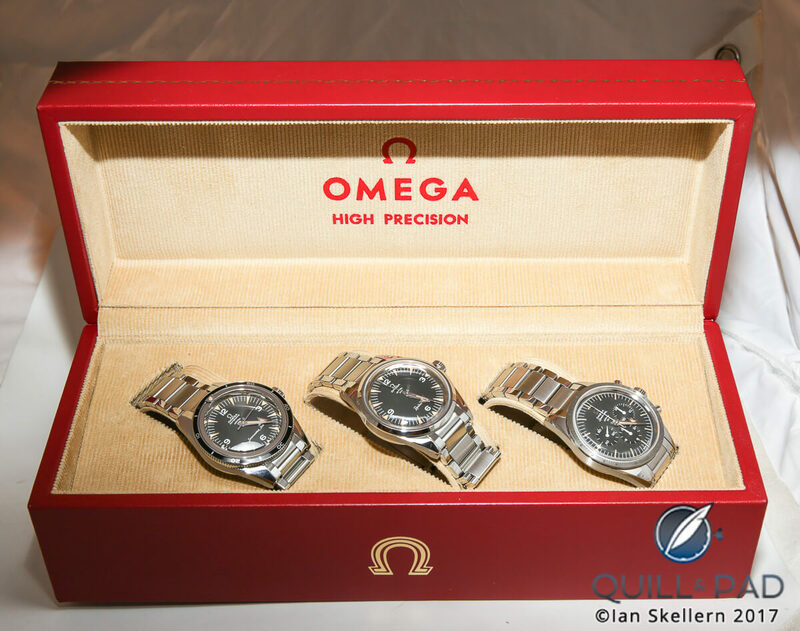 The limited edition trilogy set comprises three re-issued Omega classics from 1957: the Seamaster 300, the Railmaster, and the Speedmaster. The boxed set including all three retails for $21,600. The watches can be acquired separately or in the set. Singer particularly liked the Seamaster 300, which he found nicely proportionate. The Hublot Techframe Ferrari Tourbillon Chronograph introduced in honor of the 70th anniversary of Ferrari – one of Hublot’s partners – has had mixed reactions within the watch world. Members of our own team find that it looks a bit too “normal” compared to some of the other new watches the brand introduced at Baselworld 2017 (which goes to show what can happen with expectations when you consistently bring out wild and crazy superwatches!). However, Singer loved the way that it looked “crazy” compared to the retro and vintage-styled watches that he generally prefers. He also enjoys the fact that it looks like a car frame – which was the intended design effect. Known among enthusiasts as the 62MAS Diver, Seiko’s first diver’s watch came out in 1965. In the wake of Seiko’s very successful recent recreations that have included Grand Seiko re-editions to celebrate the 55th anniversary of Seiko’s sub-line (now a standalone brand as announced at Baselworld 2017), this diver in Seiko’s Prospex sub-line fits right in. “I love the color combinations on the new Seiko models, even if the case sizes are perhaps slightly smaller than I would have liked; this retro diver is right up my alley,” Singer said. I ran into Singer at the Blancpain booth just after he had seen this watch in one of the sales rooms, and I remember how excitedly he described it. In fact, he has tagged this watch as perhaps his favorite from the show. 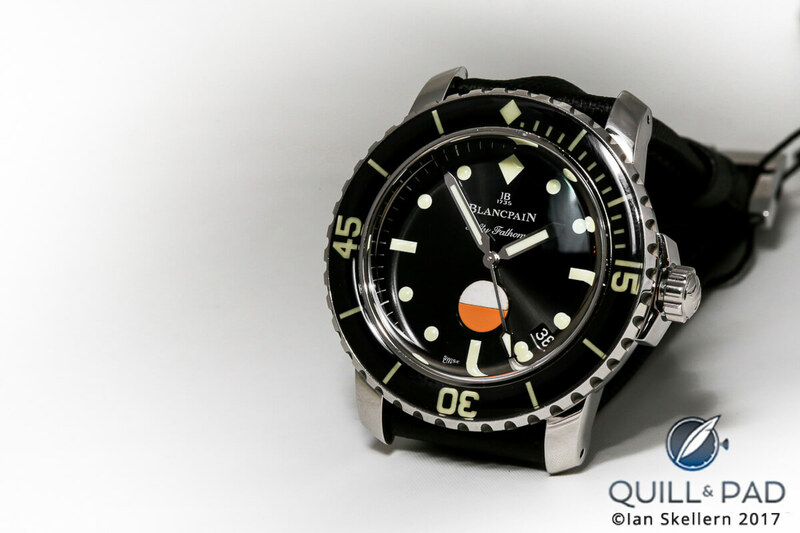 As you might guess, the MIL-SPEC is a new interpretation of a historical Fifty Fathoms from the 1950s. Its “superpower” is that it indicates the degree of water resistance the watch has (shown in the circle just above 6 o’clock); this is an element that – along with great visibility under water – makes beautiful sense for a diver’s watch. This timepiece is a reissue of a watch made for the Italian armed forces in the 1960s that was known as “the Cairelli.” Since being shown under the table to collectors and retailers at Baselworld 2016 before its official release later in that year, it has generated quite a bit of buzz among aficionados of vintage-style sports watches. Singer was already interested in the Zenith Heritage Cronometro Tipo CP2 in 2016, and its availability now puts it squarely in his top 10. He also explained that he appreciated the new Ventura models (which I incidentally also quite like), but kept coming back to this chronograph. Powered by an automatic Swiss Technology Production caliber, the quite affordable Zodiac model fits into Singer’s preferred styling range. STP is a wholly owned subsidiary of the Fossil Group. For as long as I can remember, Zodiac, which has also been owned by Fossil since 2001, has been a great deal in terms of pricing. The year 2015 marked the return of the Sea Wolf to Zodiac’s lineup; it had been absent since 2002. “I really think this is a great watch at a great price,” Singer said.